I selected them because the content is in the public domain and their articles render into small PDFs very easily using my doPDF program www.dopdf.com. Another source of public domain news content is WikiNews, but I have found their coverage of current news to be too dated, and many of their articles render into PDFs that exceed Outernets 100 kB file size. I was wondering if other Discussion Group members could provide some feedback? Frequently in posts, news ranks high on the list of desired Outernet content. Perhaps by putting our heads together, we could do magic as has been done in the Weather forecast area. I’m also curious to know how news content would eventually get included in Outernet downloads by Outernet-Corporate. Back in the Ku band days, Outernet used www.dw.com as a source and prepared the data packages. Personally I think it’s too time consuming to try and do news manually. I think getting RSS working is the way to go with this. 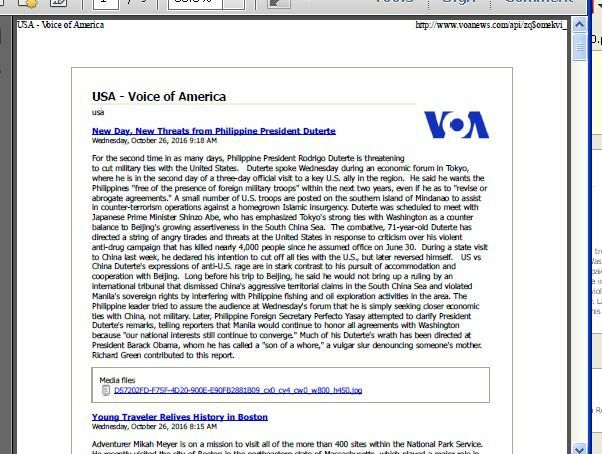 Sam, as it turns out Voice of America has RSS feeds. Given their content is public domain, that could be a solution for Outernet to explore and implement. I don’t see a clear path for you or I to do it. The only down side of VOA is some may consider it a biased source too USA centric. I have not heard much about the News Feed issue lately, but yesterday signed up for the NY Times Digest, which is a 10 page PDF (200 kB file size) of world and national news. It’s the same product we see in various international hotels and on cruise ships. Unfortunately, it is not public domain, so Outernet can’t post it now. So maybe you could look at a sample at their site www.nytimesdigest.com to see what you think of it. have not heard much about the News Feed issue lately, but yesterday signed up for the NY Times Digest, which is a 10 page PDF (200 kB file size) of world and national news. After an amazing start, Amateur Radio messages, Gribs, NOAA Wether, Online Graphical Map of user location the Outernet team, probably needs to take a break. BUT I think news will be the compelling product that really sells Outernet Library L-Band service to remote communities. I think NEWS needs to be the next push in the Outernet success story. Kens Idea of these PDF concise mini newspapers would be very nice. Completely agree with Seasalt - - NEWS will make Outernet a force to be reckoned with. I don’t how much it costs yet, but I’ve approached them as an individual user rather than a company like Outernet. I’m still searching out other options. Sam any idea on size of these newsfeed files. If the Outernet feed is multiplexing then we could receive these files as soon as they come out. 200k for a 8 page pdf means 1 MB an hour so one fifth equals 12 minutes of transmission. Newsfeeds plus 5 or 6 small pdf newspapers would not tax the download much. I have visited Creative Commons a few times, but am not familiar enough with them to find the above news feed list on their site - - help!!! I’m new to this field of endeavor and want to learn. Otherwise, it is very nice looking. I can compress the FiveFilters 753 KB PDF to 141 KB using www.onlinepdf2. which is not as clean, but the file size is smaller. I cannot compress the doPDF version any more than it is. I think that news content shall be saved in a text format with Mark down syntax, an then rendered in a newspaper view on the viewer side. I guess that PDF format is nice, but uses a “high” amount of bytes only for the format, not the content. The next step is to provide Outernet Staff some of the tools they can use to do the same putting an HTML page like this up on the system. Hi Ken, not at all! @Syed would you be up for using these files on a regular basis? I realise there is probably a more elegant solution in the pipeline but this might work for now? Set up a script on your box to wget an English, French, Spanish & Chinese version? Each at 100kb or so? I’m not opposed to VOA-content (though not personally thrilled by it). What I’m most concerned with is file size. We’ll be reducing the maximum size from 100kB to 50kB pretty soon, so spending time on chunking files would be a good idea. We may even go so far as to limit the uploads to 10kB–just so we can ensure that something new is always coming down the pipe. So a total of 220kb split over 9 files per day? This is good - - please let me know if I can help out. 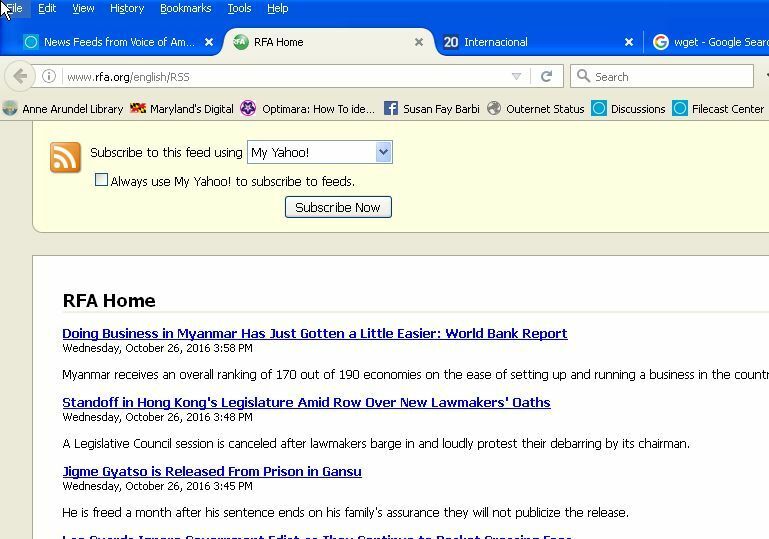 As to VOA - - I agree it’s not the best, but it is public domain, it’s there TODAY, and it is very newsy. I’ve looked at other public domain sites, but they don’t have the “look and feel” of global unbiased content I believe Outernet needs to offer. PS I hope you all like my new Profile Picture - - it is the antennas at dusk at the Varberg Radio Station at Grimeton - - an old (1922) VLF transmission facility still occasionally in operation (using an Alexanderson alternator) close to Varberg, in Halland, Sweden - - a World Heritage site. You could have a look for a Wordpress plugin / method to strip images out Rss feeds and add the author to them? Not all the feeds have a lot of pictures - - VOA has only 1 VOA logo. The RFA feeds only have titles and short summaries with no pictures - - so they may not be so good to use. 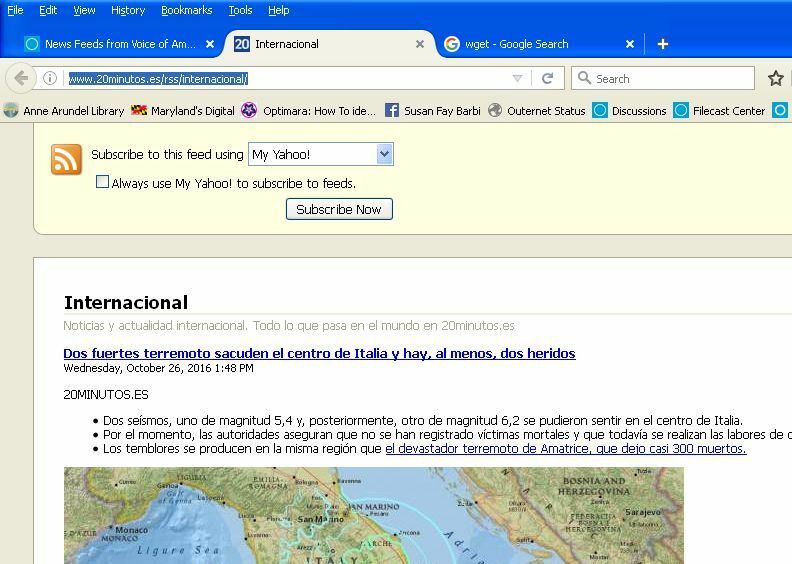 The http://www.20minutos.es/rss/internacional/ is probably a good one to experiment with as it has a good bit of text and pictures.